Anything can happen during a game of golf, especially if Willie Nelson and Oscar-winning producer T Bone Burnett are on the green. "T Bone and I are old friends and we were playing golf one day in California and started wondering why we never had done a record together, so we started talking about it," Willie tells The Boot. 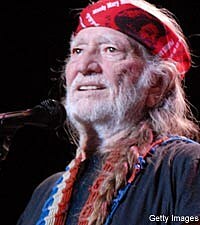 An American icon, Willie will be 77 on April 30, but continues to maintain a pace that would put artists in their twenties to shame. In addition to touring, he's planning his legendary 4th of July Picnic, which will include performances from Kris Kristofferson, Leon Russell, Ray Price, David Allan Coe, Billy Joe Shaver and Asleep at the Wheel, among others. He's also trying to slow down long enough to shoot a film at his place in Luck, Texas. 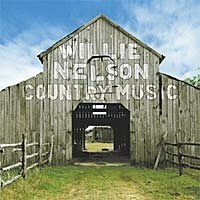 Though he has recorded nearly every style of music during his lengthy career, Willie returned to his roots on his new Rounder release. "This type of music is what I call country music," he says. "We venture into all kinds of music but this is country music. No one would argue the fact that these are country songs." "I've always said, a good producer -- like Don Was or T Bone or Daniel Lanois or Chet Atkins or Fred Foster -- these producers are sharp enough to know if they get the right people together, that's about all they have to do. If they get in a bunch of musicians and good songs in a good studio, then they can pretty much sit down and watch it all happen. That's what T Bone did. He brought some great songs, put together some good musicians and then it was up to us. I knew the songs, so I just started singing and listening to everybody around me play. It was a great experience to know that any where I looked there would be a great musician to take the course." The 15-song project was recorded in Nashville and features such classics as 'Dark As a Dungeon,' 'Freight Train Boogie,' 'Pistol Packin' Mama' and "Satisfied Mind.' "This is a group of songs that when they first came out, it didn't take them very long to become what we call standards," he says. "We cut 20 something songs, so we'll probably have another CD coming out at one time or another with the rest of the songs and naturally, they would be on Rounder." When asked what it is that makes a song a standard, Willie pauses for a moment then replies, "There is just something about the song that when you first hear it, you think 'this is a great song!' You don't know why, but you just know that it is. It speaks to you in a lot of ways and you feel it move you. You cry or laugh; when you have those kinds of emotions, when a song brings them out, it's pretty safe to say this is a great song." Willie plans to add songs from the new CD to his set list as he tours this spring and summer. "We'll probably do 'Freight Train Boogie,' 'I'm a Pilgrim,' 'My Baby's Gone,' 'Nobody's Fault but Mine,' maybe 'Ocean of Diamonds,' 'Pistol Packin' Mama,' 'Satisfied Mind' and 'Seaman's Blues' -- that's a good Ernest Tubb standard that would be real easy to do. Most all these songs we'll be doing on the show at one time or another," says Willie. "In April I'm going out and my son Lucas will be opening for me on some of those dates. We've just been having fun out here playing music." When he's not recording or touring, Willie enjoys golf and a few other hobbies. "I like to ride my horses and hang out with them. I like to bike and run a little bit. I try to do a lot of exercises so I won't go off and get in trouble somewhere," he says with a laugh. Willie also has a couple of movies in the works. "I started this film company called Luck Films there at my place in Luck, Texas where it's an old western town," he says. "We've done some music videos there and we're planning on a couple of western movies. It's a great place to do it. I have everything there that we need -- a western town, about 70 horses we could use and it's right out there in the hill country where we could shoot mostly year round out there. It's just something to keep us busy and I enjoy being around the horses and the movies. "We have a couple scripts that we're happy with and we're just waiting for a break in my schedule where I can go down there and work on them," Willie continues. "That's been the biggest hold up is I've been working so much that I really haven't had time to go down there and work on a movie. Once we do take a break then I want to get rested up before I go work on a movie, so it's kind of not exactly sure when we're starting this one." Willie has also been working on another album with his pal Ray Benson and Asleep at the Wheel. Their last collaboration, 2009's 'Willie & the Wheel' earned a Grammy nomination. "I've recorded a bunch of songs with them here a few weeks ago and that's always fun," Willie says. "It's another instance of a whole lot of good musicians together playing good music." For an artist who has recorded everything from reggae and pop standards to gospel and blues, does Willie have any musical goals he's yet to achieve? "Not really anything," he muses. "I've already probably recorded enough and probably played enough concerts, but I'm still doing it and I still enjoy doing it. I'm not ready to quit, but I'm really not sitting around trying to plan long term plans. I just sort of play it a day at a time."